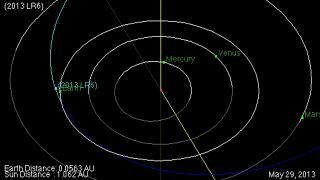 Asteroid 2013 LR6 makes its closest approach on June 8th, 2013, coming with 68,350 miles (110,000 km) of Earth. A small, newly discovered asteroid will pass within the distance from the Earth to the moon this weekend, and you can watch its approach live online today (June 7). The space rock, called 2013 LR6, is between 16-53 feet wide (5-16 meters) and is in no danger of hitting the Earth, experts say. The garbage truck-size asteroid's closest approach will bring it about 68,351 miles (110,000 km) above the surface of the planet tomorrow. You can watch a live asteroid-tracking webcast on SPACE.com today that features views and expert commentary hosted by the Virtual Telescope Project in Italy beginning at 3:30 p.m. EDT (1930 GMT). You can also follow the broadcast directly through the Virtual Telescope Project. "It is a very safe distance, so it will be a great show!" astrophysicist Gianluca Masi with the Virtual Telescope Project wrote in a statement. At the time of the webcast, the asteroid will be about 186,411 miles (300,000 km) away, Masi said. Tomorrow, when it makes its closest approach, the space rock will be visible from only the Southern Hemisphere. The asteroid, at a magnitude of about 16.5 on the astronomers' brightness scale, is too dim to be seen with the naked eye. This flyby comes on the heels of another close brush Earth had with a space rock last Friday (May 31). An asteroid the size of nine cruise ships dubbed Asteroid 1998 QE2 whizzed by our planet traveling within 3.6 million miles (5.8 million km) of Earth's surface. 1998 QE2 has its own moon, estimated at 2,000 feet (600 meters) wide, according to NASA. 2013 has been a big year for close encounters with near-Earth objects. On the same day in February, an asteroid the size of a football field flew within 17,200 miles (27,680 km) of Earth, while — in an unrelated incident — a meteor exploded over Russia, injuring hundreds and damaging property. Follow Miriam Kramer on Twitter and Google+. Follow us on Twitter, Facebookand Google+. Original article on SPACE.com.